Look at the cover of this book. Oh my goodness, how on earth can you possibly resist such a thing?! I absolutely could NOT. See, here's the thing. Stephanie over at Olive Tree had talked about Tumtum and Nutmeg and I told her I thought the books sounded pretty cute. 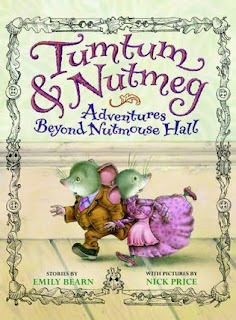 But then I went into our local Borders bookstore on an expedition and there - sitting innocently on the shelf - was a copy of Tumtum & Nutmeg: Adventures Beyond Nutmouse Hall . I wasn't actually intending to buy anything on this particular expedition but these trips can include fun surprises. I dropped every other single reading "project" and book, tucked the kids in for their nap time and grabbed this little gem. This ranks among my "Crazed-about-Mysterious-Benedict-Society" reads. You should read that last statement to mean that this is not the last time you'll hear about Tumtum & Nutmeg from me. Oh no! First, we meet the married mice who live in Nutmouse Hall which is located in the forgotten broom closet in Rose Cottage. (Oh, and they live in England which I think is perfection for these mice!) Tumtum and Nutmeg are the mice's pet names for each other. Tumtum got his name because he has one, and Nutmeg received her name due to her coloring. They decide to take care of the children who live in the house, Lucy and Arthur, who are languishing under the care of their rather absent-minded professor-ish father. The children think that their socks are being darned and their room cleaned by a fairy. Little do they know that it's a happy set of mice who are doing all the hard work and taking up temporary residents in Lucy's dollhouse. 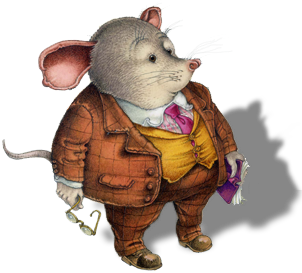 The follow-up adventures of Tumtum & Nutmeg include an interesting cast of characters which include General Marchmouse, gerbils, and some dread pirate rats! Cute. Delightful. Totally wonderful in every way. I DON'T WANT TO WRITE A REVIEW! I JUST WANT TO RAVE! I finished the first three books in no time flat and then bribed my first born child over to the couch to bond with the mice. We nibbled our morning snacks while meeting up with the Nutmouses and we enjoy ourselves. We're reading at least a chapter a day and more if I'm allowed. That is correct, my friends! I finished the book, (as in - snapped it shut), and immediately started back at the beginning with my son. Hey! There are pirates in this book and the best way I knew to bribe him in was the promise of reading TO the pirate part by means of mice snacks. I don't care! He has to know the glories of these books! LOOK AT THE TUMTUM AND NUTMEG WEBSITE! I KNOW this is a pathetic post but sometimes we just must be pathetic and that's that. I'm not going to host a Tumtum & Nutmeg Reading Challenge or anything. Please don't make it come to that. 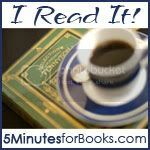 I'm linking this up to the I Read It! carnival at 5 Minutes for Books because I read it at Stephanie's recommendation. Have you read something that was recommended by another blogger and you want to share about it? (Nothing as fun as THIS particular book, I'm quite certain!) However good your read (or bad), feel free to come and join us in this carnival. Maybe next month you can talk about how you read Tumtum and Nutmeg and you can mention how I harassed you into the book(s)! Wouldn't that be fun!? Hmm?! Well, Carrie, if you recommend it as highly as MBS, I will jump in! I intend to get one from my library to see for myself...and then maybe give them to my daughter for her fourth birthday...our first chapter books! I have this post saved for the future! Oh, that does look attractive. I love good children's books. I'm blushing! Who knew I had so much power! : ) We have the Christmas one, but haven't read it yet ... truthfully, N1 got it for Christmas and I haven't seen it since! : ) And, thanks for the tip for the new book that is coming out! I've gone to Amazon and preordered it as it will arrive just in time for a certain 7 year old's birthday (will she really be 7) and she will be SO excited. You are hilarious! Maybe I'll read them to Kyle. By the way -- I have to amend your little recommendation (having kids in the target range). Eight would be a bit young to really appreciate MBS, I think, and based on my nephew's and daughter's reception of Strictest School, I think that they are best for 12 on up (I haven't read them -- but Amanda didn't like them at 10, and usually that's because she doesn't quite get them. Also, they are shelved in our YA section, which is usually 12 +. How cute! I'll mention these to my daughter. She's not too into picture books these days, but she's big into art, and I think she'd love these characters. Thanks for visiting today! My dog's name is Nutmeg. YES! Z needs these books! I'll have to put them on the LIST. They look adorable! Just requested it from my library. Ha, ha! I loved this just because you don't have any girls but you came home it with anyways! Read this book to my girls based on a bloggers review. The three of us loved it! The cover and pictures were so cozy! Just finished reading Miss Buncle and Miss Buncles wedding from your review and it was a funny pleasant read.